We have developed our shipping policy to offer you the best value for money with the greatest flexibility. The price charged for shipping is calculated based on the weight of the items ordered together with the delivery method employed. In most cases we will use 1st class post and you will be charged the price for the total weight. Providing you order before 2pm, Mon-Fri we will dispatch your order that day. Alternatively, if you order lots of items or larger items we may dispatch your order by the Hermes tracked service. Hermes offer a more cost effective and secure service which is fully tracked and insured. 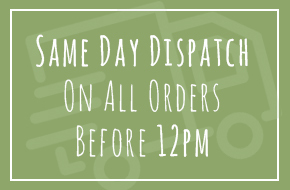 We aim to dispatch all orders received before 2pm on weekdays, the same day. All orders received after 2pm will be dispatched on the next working day. If ordering from outside Europe please email or contact for prices.